When The Ivy Montpellier Brasserie opened it's doors last month, it seemed like the whole of Cheltenham was talking about it. And I'm not surprised, based on the reputation of the Ivy's other venues, something exciting was coming to Cheltenham. I was invited to the preview night in December, but it was just two days after we landed home from our honeymoon, so I was sensible and decided to sadly miss out. My good friend and foodie, Sheila, also wasn't able to make the launch, so she arranged for us to go back this weekend and give the brunch menu a try. As soon as we walked in the door, the team were welcoming and attentive but not at all overbearing. 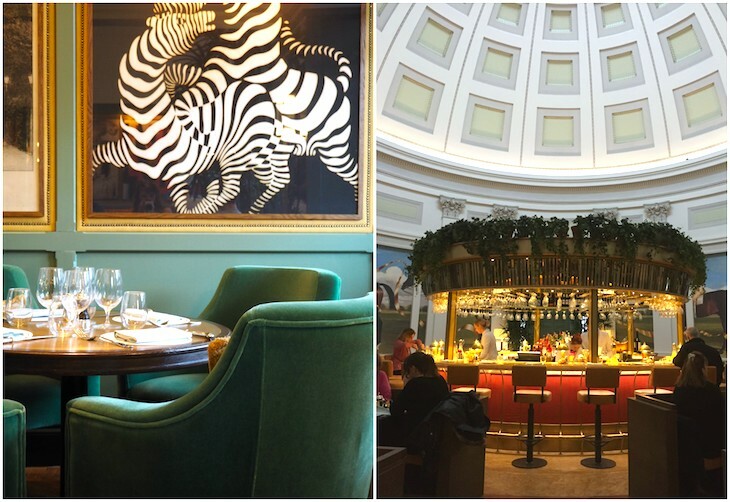 The restaurant is located in a beautiful grade 1 listed building in the heart of Cheltenham, with a huge domed roof and a circular bar in the centre making up the main section of the restaurant. The decor is quirky and bright, but still feels luxurious with plush velvet chairs, soft cushions, and walls covered with murals and botanical prints. It's definitely a sight to see and somewhere a little different for our town. The brunch menu starts from 11am on a Saturday, with a breakfast menu running previously but still containing many brunch favourites. The brunch menu was more extensive, with a wider range of savoury lunch and dinner dishes - perfect if you're with a mixed group and some want a hearty lunch but some prefer a lighter breakfast dish. 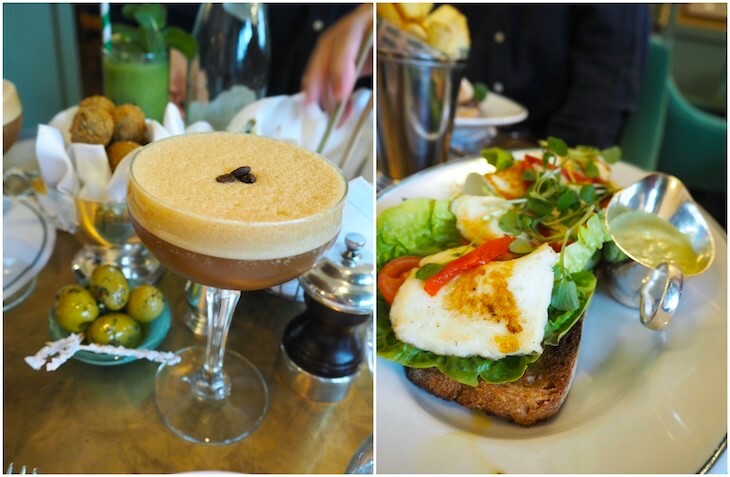 We started with some of the nibbles from the menu; truffle arancini, zucchini fritti and spiced olives, accompanied by salted caramel espresso martinis - the perfect start to a Saturday! The nibbles were all so tasty - but a special commendation is required for the zucchini fritti. We weren't really sure what to expect, but a dish of delicious crispy, salty coated strands of courgette appeared with a lemon, chilli, mint yoghurt dip. Moving on to round two. It's impossible for me to see pancakes on a brunch menu and not order them... does anyone else have this problem? So that was me sorted. Because of this, I have to admit that I have tried a lot of pancakes in my time... and these didn't disappoint. It was the fluffiest stack of pancakes, sandwiched with creamy greek yoghurt and topped with fresh berries, lemon balm and warm strawberry sauce. Yum. Josh had the 'HLT' - grilled halloumi with avocado sauce, tomatoes, olives, red peppers and lettuce on sourdough. A nice change from the standard veggie brunch option. Overall, I was really impressed with The Ivy and I'll definitely be back. It's the perfect place to go for a special occasion, or when you just fancy brunching in style. It's definitely up there in my top 3 brunches in Cheltenham - I can see it becoming a regular visit. 10/10.